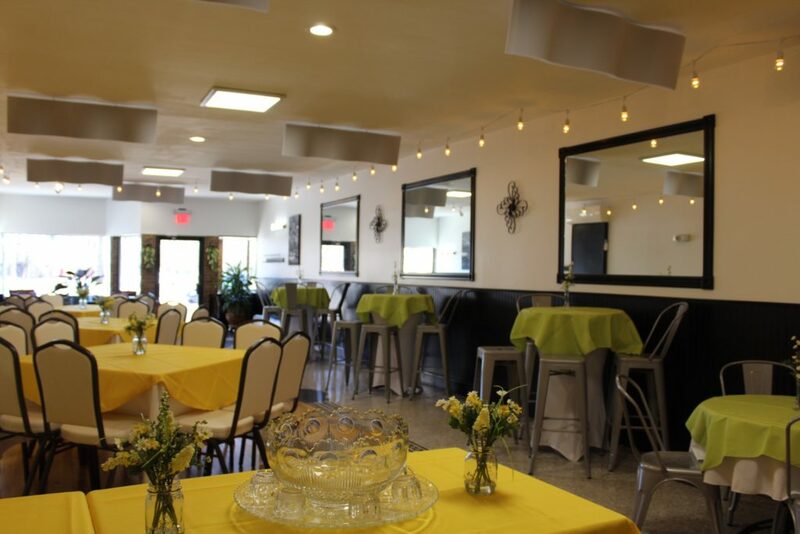 Located between Maribeth’s and Jilly Beans in downtown Hillsdale, Venue 8 pro­vides an ideal space for showers, business meetings, fundraisers, and other gath­erings. Owner of Venue 8 Mindi Meyer said she has owned the building for 35 years. Meyer said the building was orig­i­nally Cook Bank and has marble floors dating back to 1884. She dis­covered the marble floors five years ago while doing some ren­o­va­tions. “The interior has an older charm,” Meyer said. Hillsdale res­ident Jill Taylor rented out the space for her baby shower and said Venue 8 offered a unique setting. Diane Clow, a Jonesville res­ident, attended Taylor’s baby shower and said she was glad the his­toric building was repur­posed for a venue site. In addition to the timeless structure, Meyer has vintage glassware from the Man­hattan col­lection of the 1930s. She said she plans on pur­chasing more vintage glassware, including punch bowls. Taylor said she appre­ciated the history of the space and said the location of Venue 8 was ideal. “The fact that it’s right downtown made it easy to tell people where to go,” Taylor said. “It’s a central location for everyone. Venue 8 has space for 50 people, and Meyer said she pro­vides guests with tables, chairs, and table­cloths. Taylor said the space was the perfect size for her baby shower. Cur­rently, Meyer said she is searching for a caterer and has not decided upon one. People can rent the space out for half days and full days with prices varying depending on the day of the week. On Sat­urdays and Sundays, the space is cur­rently only available for full day rentals. After her baby shower, Taylor said she was very pleased with Venue 8 and Meyer was easy to work with. “I whole­heartedly rec­ommend it to anybody,” Taylor said.